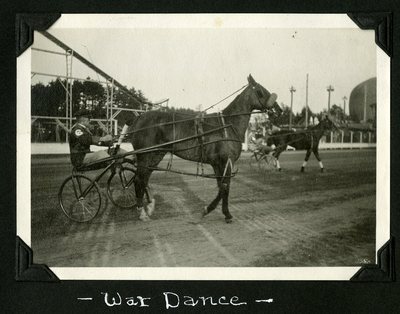 Black and white photo of War Dance and driver J. Nevell at the 52nd Annual Rochester Fair at Cold Spring Park, Rochester, N.H., Wednesday, May 28, 1927. War Dance's tack includes a shadow roll to obscure shadows from the horse's line of vision as well as a blind bridle to block the horse's vision to the besides and behind him. The strap extending down the horse's front leg is a knee boot suspender. Knee boots prevent injury from the horse hitting his knees together while racing. The horse is also wearing hopples to help maintain his gait when pacing. The horse Bessie Direct and driver E. Bray are visible in the background. Also note the large, timber ramp system in the background directly behind War Dance. In the right side of the background, note the unusual dome-shaped structure.